Anyone who has forked out silly money in a restaurant for Alta, or even Zapata, will know that Catena produces the daddy of Argentinian Malbec. Feeling a bit silly for never having tried their Chardonnay, I instructed my bank manager to remit 995 new pennies to the Wine Society and this is what I got in return (postage included). Chardonnay, and in particular South American Chardonnay gets a bad rap for a being a bit passé, a bit Footballers’ Wives. The shout at every wine bar in Peckham in the PPG (Pre-Pinot Grigio) era, might seem a little bit 1980s, but in my experience, most non-winos when questioned, don’t even realise that the finest white Burgundies are Chardonian. I, for one, would like to see a revival of this classic old world grape, especially when experimented with in the new. So I have high hopes from one of my favourite wine producers, from one of my favourite wine countries (not that I have forgiven Maradona for the 1986 Hand of God incident). Just as it is a massive error to drink red wine too warm, over-chilling a rich Chardonnay will stifle your enjoyment. If you are going to put your bottle in the bottom of the fridge for 3 days, you deserve all you get and you could save a lot of money by drinking Echo Falls, since it will taste equally bland. About 20 mins in an ice bucket (from room temp) should be more than enough. I like to drink it in a large, wide bowl glass to maximise the nasal intake. And the aroma is likely to blow your socks off, or make you gag, depending on your taste buds. The Catena is richer than Tiger Woods, albeit more faithful. It tastes stronger than the 13.5 ABV that it is. Pineapple and stewed fruit combine with sautéed flint stone to give a pleasantly warm and buttery acidity. It’s not going to beat a top Burgundy, but at a third of the price, it doesn’t have to. 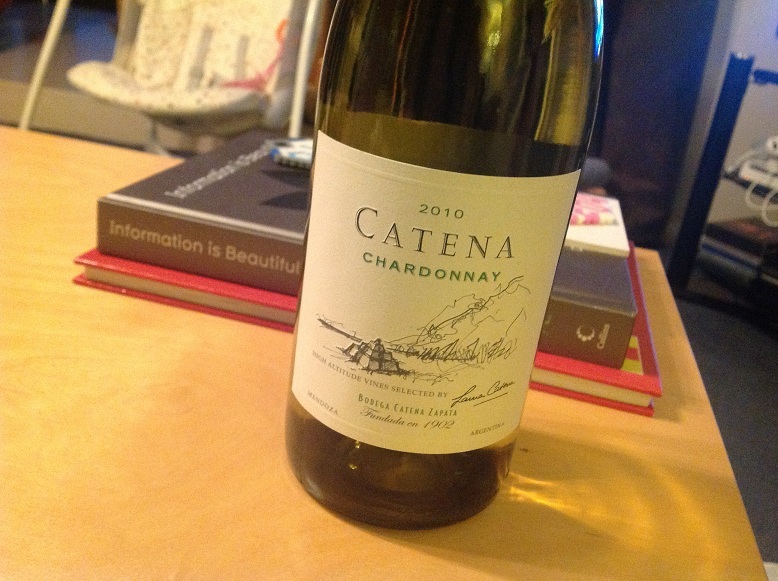 Catena is available widely so if you have some weird vendetta against The Wine Society you can find it at Bibendum, Winedirect, Slurp.co.uk and others. This entry was posted on Saturday, October 13th, 2012 at 8:18 pm	and is filed under south america. You can follow any responses to this entry through the RSS 2.0 feed. You can leave a response, or trackback from your own site.